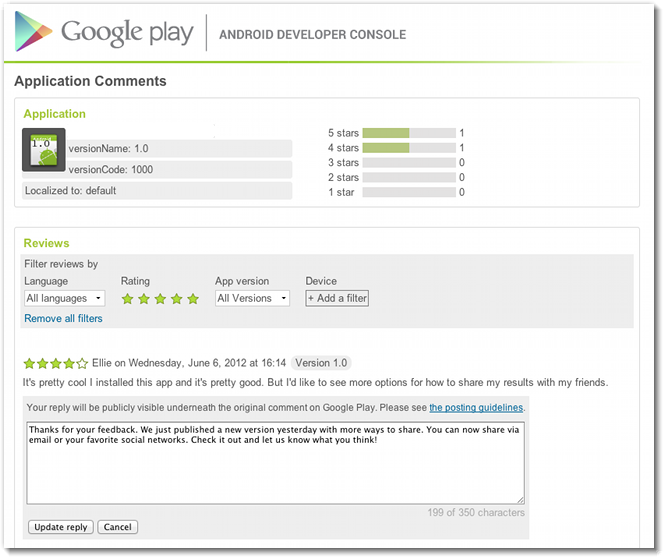 The comments section on an app’s page in Google Play is an important section. If a potential buyer is looking for a quality app, they can browse through comments to see if the app has problems or if it lacks certain features. For those that have already purchased an app, leaving comments has been the best way to provide developers with feedback on bugs or requested features. Up until now though, developers have been unable to respond directly, making this somewhat of a 1-way street. Starting today for “Top Developers,” with roll out to additional developers down the road, publishers can now reply directly to comments left on their app’s listing. Whether it be to help users, answer questions, or inform folks of new feature additions, this should be a great way for developers to stay in touch with their users. Keep it up, Google. Galaxy Nexus Listing in Play Store Outs Jelly Bean as Android 4.1, Arriving "Soon"